Covent Garden, Charing Cross and Leicester Square underground stations are all a 5 minute walk away. We don’t think good times are complete without some great live music so we feature a collective of some of London’s most talented blues musicians playing 2 or 3 sets nightly up to 1am. BBQ & Lobstershack. We're a local institution, with an international following. Home smoked BBQ, fresh flown in lobster, steaks, margaritas & music. Good food and drinks. Good atmosphere also. 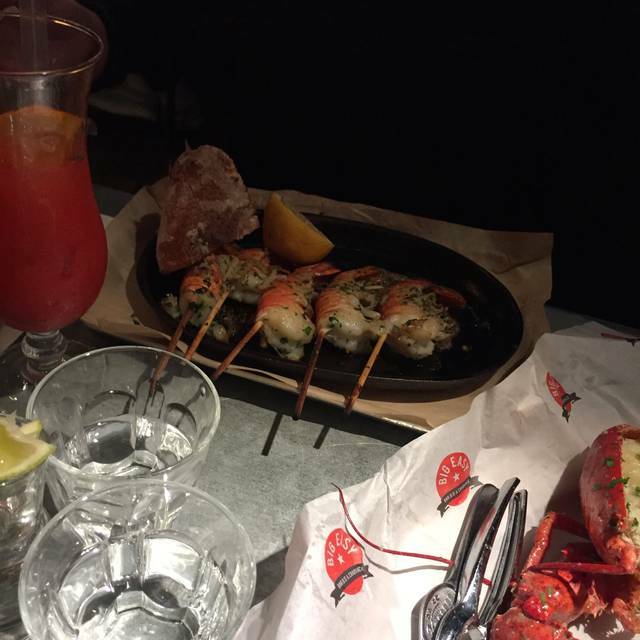 Our main came before the starters, then 1 starter came whilst we were trying to ask them to take away the lobsterman. Then when the waiter was informed, it took awhile for this to register. Our table waiter was a very astute young woman who tried to rectify this mix up. She even informed the manager... who actually did nothing, not even apologise for this... he just gave us the bill... the wrong bill. If our table waiter was not such a genuine lovely person, I would definitely not have paid the service charge. The Big Easy was recommended to us and was initially booked for 3 people. We tried to change the booking to 11 but was told they couldn't but all come in and they would sort something out. We were given 2 tables, 1 for the adults and 1 for the children. The service was great, staff really friendly and cant do enough for you. 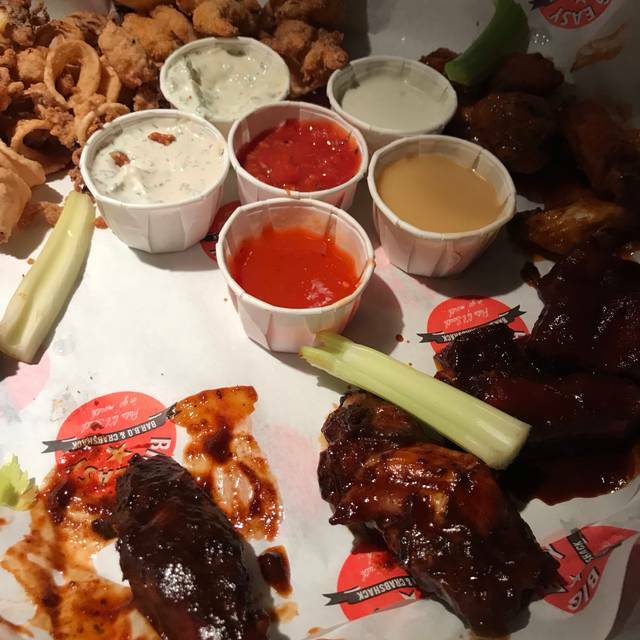 The food is amazing and you get plenty and I am a big eater! I cant wait to visit here again and if you ain't been yet, get down there! Really disappointed. Ordered the brisket to be told I could only have it in a sandwich. I didn't want the sandwich just the brisket. I asked if they had brisket and the waitress said they did but it takes too long to cook?? So I said do you not have it available and the waitress said yes just in a sandwich. I became very frustrated and ordered something else. Very disorganised. Drinks also took 25 minutes to come. 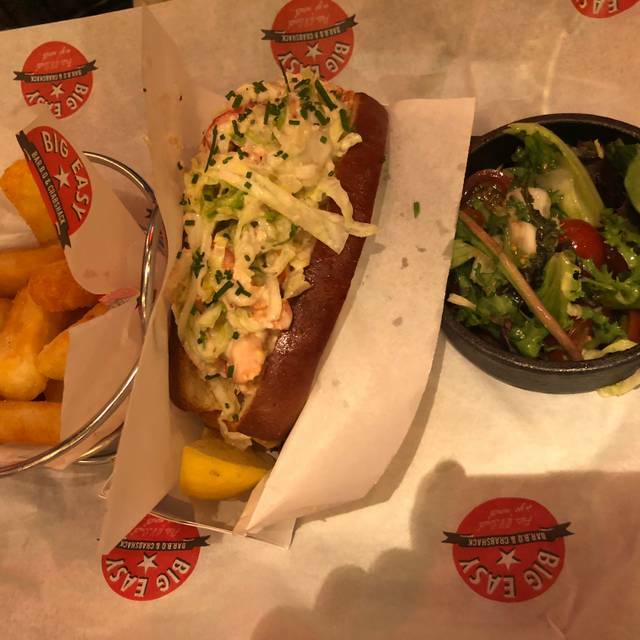 I have been to the Big Easy in Chelsea before and it was superb but Covent Garden was nowhere near as good. We made a reservation so should have had a decent seat but we were crammed in down stairs right in the thoroughfare so my wife was hit in the head twice with trays and every time someone went past was barged into, not pleasant!!! The food was ok but the ribs tasted of whatever fuel they were cooked over. I did complain and had the service charge refunded but not a great experience at all. Love The Big Easy for the atmosphere and good food. Service last time pretty poor. Very difficult to get attention of waiter to order drinks or to clear things. No smile either. But all in all we had a good time with good company. Good night out with friends. Did the wings and they were OK. Voodoo much better that the rather poor BBQ ones. 9/10. Only thing to improve would be warm wet hand wipes! The restaurant has great charm and character, and our waitress was amazingly intuitive and always on the ball even when we ran out of salt! Came here for the 1st time for the misses birthday , food was amazing and they have the best bbq sauce I’ve ever had. I didn’t know what to choose as all of it sounded and looked so good so I went for a chicken , rib and shrimp combo and I was not dissapointed it was lovely . I’d defo recommend the rib it’s so tender just falls off the bone and you can taste the smokeyness when you bite into it 👍 also I had the banana and cream pie slice for dessert and being a massive Banoffee pie fan it was amazing . service was also good our waitress was very friendly and welcoming. I plan on Visiting again soon with friends. Good value for money . 2nd visit to this restaurant not like the first which was great. Food was ok. We chose the big pig gig but the plate refill took too long to come and ended up coming in two parts. The second well after we had finished! Drinks were slow to arrive as well and our waiter seemed disinterested. Two attempts at asking for water. The menu is inflexible. Children get ice cream included, there are loads of ice cream flavours but children can only choose from 3, why? Also the big pig gig comes with a stein of beer but no other alcoholic option is available. In summary the food was ok but the place was really let down by the service both from the kitchen and also the waiter. I probably won't rush back and would struggle to recommend. 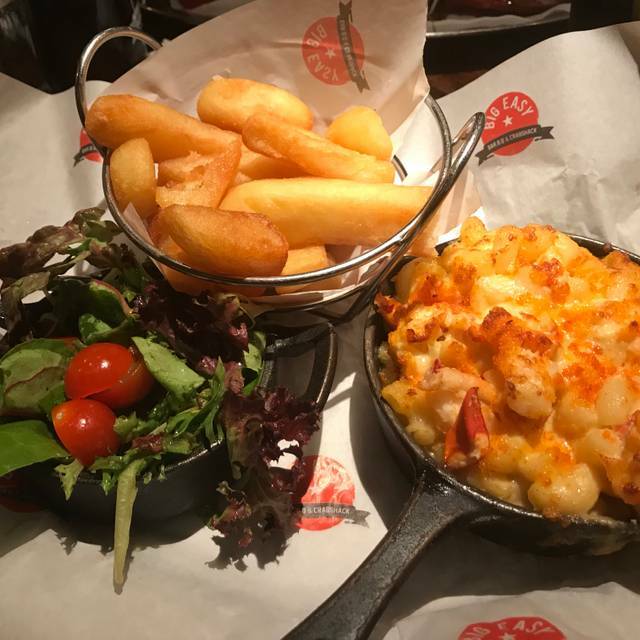 Atmosphere was great staff very helpful, music was top notch food let it down, my meal was cold sent back came back lukewarm, friends meal lobster mac and cheese very little lobster, both partners had the chicken burger that was over cooked so were hard to eat. 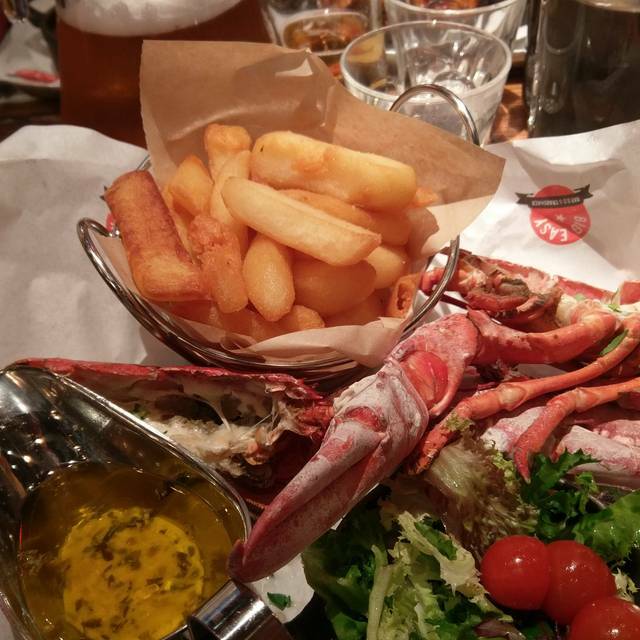 Lovely lobster and steak, bit noisy but overall good vibre, get our table on time for our reserved time. would come again! The Boozy Brunch is amazing! 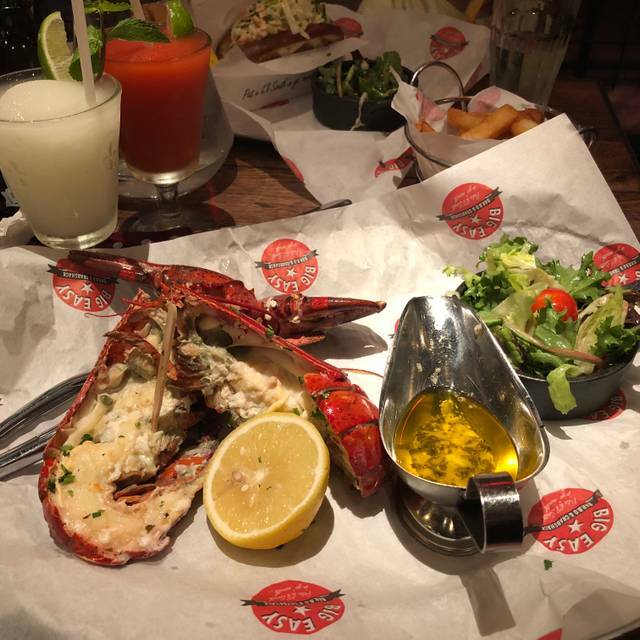 Amazing food, great value for money, brilliant theme across the restaurant and Booze! Very happy with food options and quality of food. Have to admit though that, over time, value for money goes down very fast. TBH - food was nice. Server came over about 5 times in a 2 minute period when we were trying to look through the menu. Staff were on hand when we required drinks and was a good meal. It was a great experience, food and service was very good. Upon arrival, we were welcomed and seated quickly but then had to wait around 15 minutes before anyone came to take our order. The express lunch menu was good value at £10 including a drink and the portion size was adequate. Our experience was somewhat marred by our rude waitress. She was so miserable and was getting annoyed with us when she couldn’t understand us when we ordered drinks! The fact the music was so loud didn’t help either. When the wrong drinks arrived, she was clearly annoyed at having to change them. I’ve never known a waitress be so rude and abrupt. She didn’t smile once and we felt we were a general inconvenience being there. A service charge of nearly £20 was added to our bill and although we paid it, in retrospect we wished we’d asked for it to be taken off. If you don’t like dealing with the public, why get a job in a restaurant? I would go back as the food was good and the price was really good value but hope to not get this waitress again. Very friendly server, brilliant food as always! Great food and drinks but the waitress was awful. Completely disinterested and it seemed like we were bothering her when asking for anything needed, such as to place food or drink order or bill. Food and value was excellent. Only part that spoiled the evening slightly was the service. The waiting staff were very attentive, however when first arriving on time for our booking we were largely ignored after being motioned to the bar to await an available table. We ended up waiting close to 30 minutes after our booking time until we were eventually seated, and that was only due to the fact I had to go and remind the front of house staff that we were in fact still waiting. For a company who’s policy insists on charging you if you fail to make your booking, I found this pretty poor. Other than this, everything else was excellent. Great Food and Service. We were seated promptly. My friend visited for the first time and loved it - she wants to visit again! Decided to eat here, very busy. Booked our table which was fine, got served quickly. 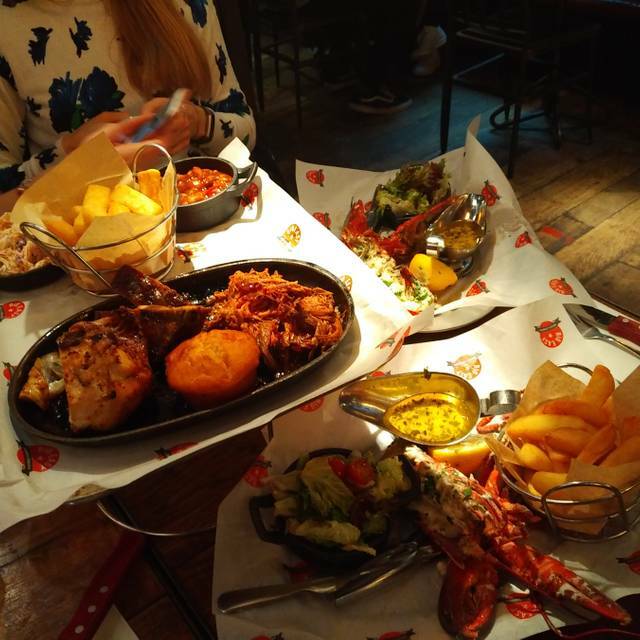 The lobster is amazing, my friend enjoyed his unlimited chicken wings too. Fun novelty bibs are also given out to stop you getting messy, which is nice! Had an awesome night! The service was amazing and the food what brilliant! 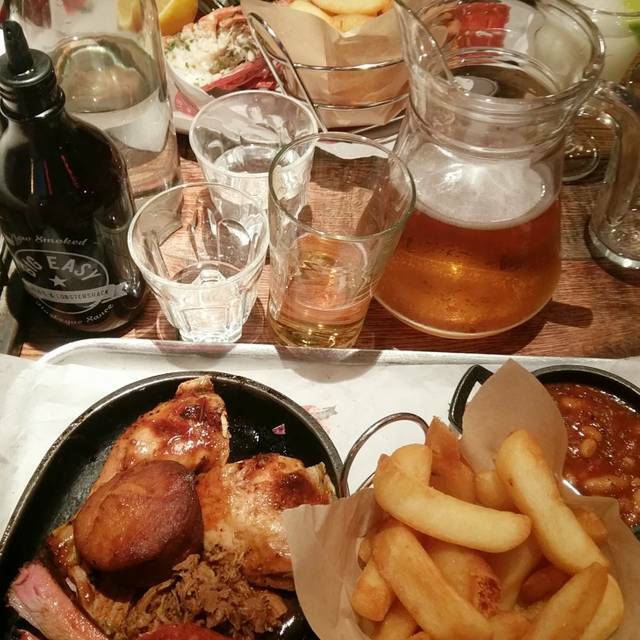 Coming from Kansas City we didn’t expect to find great BBQ in London. However, Big Easy fits in with the best BBQ worldwide. Best value seafood restaurant in the town. 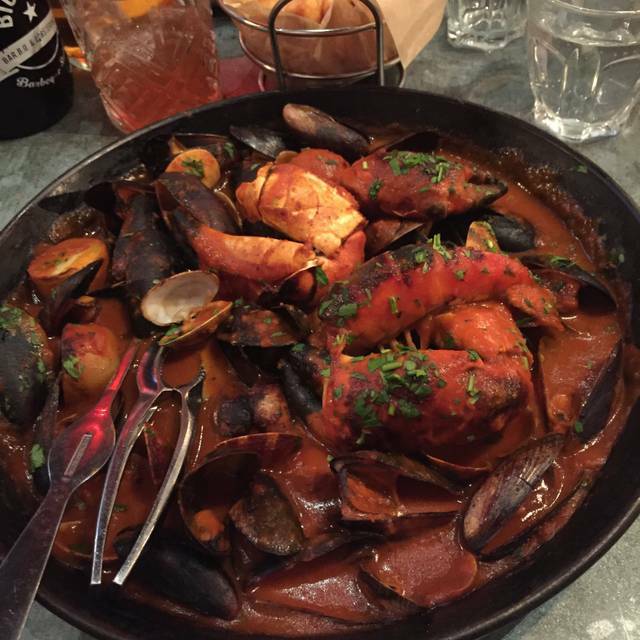 Great service and a generous portion.